For me, the approach and descent from an alpine route are often the least enjoyable aspects of the climb. Approaching has become a necessary evil, a means to an end, the required predawn slog in order to climb. As for the descent, I am often tired and have to focus on getting down safely. I've heard the popular climbing adage often; most accidents occur on the descent. At my home area, Rocky Mountain National Park, the day starts before dawn as we approach for The Barb on Spearhead located approximately six-plus miles into the park. We are making an early attempt as last year large crowds kept me from the climbing the route. Since it is mid-June, I anticipate lots of snow on the approach and possibly filling the flake at the start of the first pitch. This is where the Kahtoola MICROspikes shine. In the parking lot, I slide this "ice-traction system" on over my lightweight shoes in under a minute. With my headlamp, I can see the stamped label "front" along with a small bar to orient the MICROspike to my shoe. A pull-tab in the back of the silicon band provides additional grip as I tug these on. Since I am wearing lightweight trail shoes, I make sure to pull the silicon band higher up toward my shin where it reduces to fit snuggly over the shoe's soft upper material. In the process, the steel chains and teeth are pulled taut against the sole for a secure fit. The 12-MICROspikes per foot offer that extra grip needed to help me relax and focus on my next step upward. I'm loaded down with a heavy pack listening to other parties discuss their plans for the same route; getting stuck behind a slow party could prevent us from summiting. Despite my early morning lethargy, I command my legs to pick up the pace. After charging up the trails, wading through deceptive gullies full of knee-deep snow, and crossing a precarious snow bridge above Black Lake, I am standing beneath the final steep snow tongue and easily stride upward. I am grateful to reach the base of the first pitch, rack up, and tie in before finally seeing the other party just reach the snow tongue. At the base, I make sure to add the MICROspikes into my small daypack. They are lightweight and compactable. 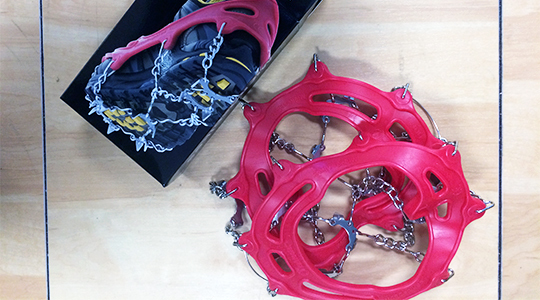 The Medium pair weights 13.6 ounces, about the same as one large cam and almost half the weight of most crampons. They ball up to the size of a grapefruit but can also be wedged into any nook or cranny of space left available. I know I will be grateful to have these for the long, arching descent. In the summer, I wear a lightweight trail shoe for alpine approaches as I can carry these in my summit backpack for the descent. However, I have used the MICROspikes with light hiking boots, my ice-climbing boots, running shoes, and even a few times over my ski boots. I have used them for winter trail running and hiking. I found the MICROspikes to be effective at promoting confidence and surefootedness in a variety of situations and terrain. Their hardiness can be a limitation, as the MICROspikes can feel too grippy when my pace is quick on flatter, softer terrain. In those situations, their purchase can create drag and increase my fatigue. At the same time, they are not crampons and expecting them to penetrate deep snow or frontpoint into ice is unrealistic. While I can get them over my ski boots, their use is limited and a pair of crampons has far more utility. I have worn the same pair for eighteen months in a variety of terrain. Sometimes I have been too focused to slide them off between patches of snow and rocks. The stainless steel 1cm spikes have maintained their shape. The red silicon band is surprisingly durable, looks pristine, and preforms the same as when brand new. Regardless of their few limitations, the security these provide is well worth the added weight. Cons: Limited scope of use, "overly" grippy on soft snow, teeth are too short to penetrate deep layers of snow.